With the lock-down on this one would think that John Williams was writing the score. Well, not quite, but after Djawadi's work for IRON MAN and CLASH OF THE TITANS, I have to say that it could prove to be a good choice. In fact, if you want to get a glimpse of what is to come, Amazon already has clips available. Listen to them here! REDWOOD CITY, Calif. – September 23, 2010 – Electronic Arts Inc. (NASDAQ:ERTS) has recruited award-winning composer Ramin Djawadi to create a deep and meaningful audio experience for the modern combat first-person shooter, Medal of Honor™. Known for his recent work on the Iron Man movie, the “Prison Break” television series and the remake of Clash of the Titans, Ramin Djawadi creates a score to match the intense soldier’s story and Tier 1 experience told throughout Medal of Honor, which takes place in the current war in Afghanistan. 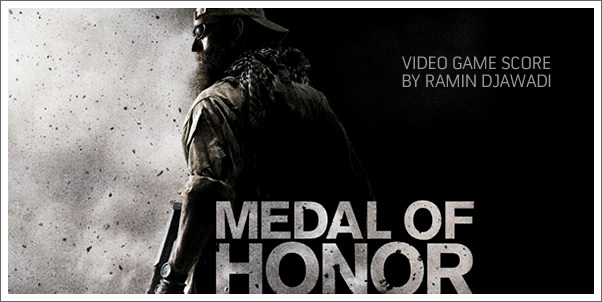 Medal of Honor score album will be available on iTunes Tuesday, September 28, 2010. "The new version of a landmark game always requires a next-level soundtrack," said Steve Schnur, Worldwide Executive of Music and Marketing. "But this 'reinvention' of Medal Of Honor demanded a composer who could create an epic score that brings the game into a whole new era. The intuition and skill that makes Ramin Djawadi one of Hollywood's top young talents in film scoring is exemplified in MoH. This is an incredibly intense score, and we're tremendously proud to have him in the EA family." Medal of Honor launches on October 12, 2010 in North America and October 15 in Europe for the PlayStation®3 computer entertainment system, Xbox 360® videogame and entertainment system and PC. Follow the game on twitter at: http://www.twitter.com/medalofhonor or become a fan on Facebook at http://www.facebook.com/medalofhonor. Electronic Arts Inc. (EA), headquartered in Redwood City, California, is a leading global interactive entertainment software company. Founded in 1982, the Company develops, publishes, and distributes interactive software worldwide for video game systems, personal computers, wireless devices and the Internet. Electronic Arts markets its products under four brand names: EATM, EA SPORTSTM, EA Mobile TM and POGOTM. In fiscal 2009, EA posted GAAP net revenue of $4.2 billion and had 31 titles that sold more than one million copies. EA's homepage and online game site is www.ea.com. More information about EA's products and full text of press releases can be found on the Internet at http://info.ea.com. EA, EA SPORTS, EA Mobile, POGO and Medal of Honor are trademarks or registered trademarks of Electronic Arts Inc. in the U.S. and/or other countries. Why do people keep giving this guy a job? The samples sound exactly like Black Hawk Down or Modern Warfare. I expected nothing else from this Zimmer clone. Why couldn't Lennertz or Giacchino have been offered to return. Since a reboot into the "modern" era, it isn't such a surprise that the music is taken in such a direction. Listening to the whole score, there are some interesting bits that help differentiate it from Modern Warfare...but definitely in the same vein. An old school MOH score from Giacchino or Lennertz wouldn't work well in this setting...although it would likely be a nice listen outside of the game.